Have you ever perused this section in personal ads? Somebody has a moment's connection with someone else but then never gets their name or number. 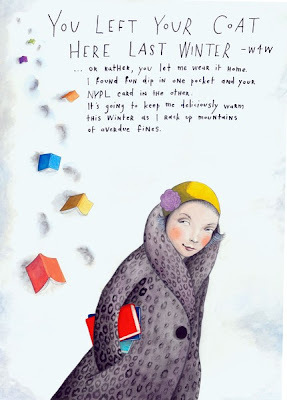 Brooklyn-Australian artist Sophie Blackall has a Missed Connections project on Etsy. It is an ongoing series of paintings based on real, anonymous messages posted online by lovelorn strangers. She has also illustrated over 15 children' books. 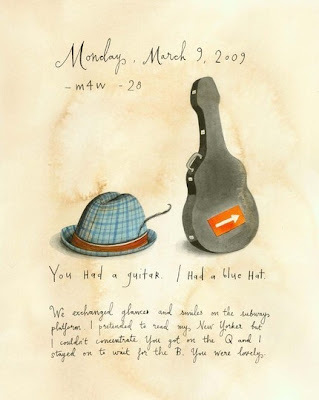 This one says: You had a guitar. I had a blue hat. We exchanged glances and smiles on the subway platform. I pretended to read my New Yorker but I couldn't concentrate. You got on the Q and I stayed on to wait for the B. You were lovely. Or this one: You left you're coat here last winter. Or rather, you let me wear it home. I found Fun Dip in one pocket and your NYLP card in the other. It's going to keep me deliciously warm this winter as I rack up mountain of overdue fines. How cool are these, for $40? Fodder for good fiction, I say. Check her out yourself on Etsy. I just discovered her shop recently too - so cool. And I love reading that section of the paper! There's an entire section on Craigslist devoted to these. It's a great idea...and what a great idea for artwork. She's brilliant! Oh these are just gorgeous! And yes, story ideas abound! SO great meeting you in person last night Christina! I'm still feeling inspired! We'll have to meet do it again soon! Thanks for coming by my blog on my SITS day and commenting, I really appreciate all the comment love! I check that blog all the time. I just love them..sometimes they give me the chills, so sad but adorable. I read these all the time! I always found them to be really sad, though. And I wonder how many people actually found the ones they were looking for. I've never read that section of the paper but it does seem like interesting inspiration for art. you are an amazing artist!, jumped by sits, Have a beautiful day! What a cute idea for artwork! Love it. Love them,and now off to Etsy to check her shop and yours out. Thanks for letting us know about this artist - love the concept and the illustrations. Oh! I love when people use novel ideas to make a living. I wish I could come up with such an idea. It's great. This is such a cool idea! Although, I must admit I dread taking a peek because my husband had one of his customer's right one about him a few years back on Craig's List. We were horrified. He doesn't wear his ring when he work becuase he cuts and crries thousand lb. boilers and such out of buildings and homes' basements-- he could lose a finger! p.s you got an award on my blog! Well I don't take the paper, and look at what I am missing. That is cool.